This is the story of the miraculous appearance of the Virgin Mary to a Muslim in Bethlehem on the first day of Holy Week 2012. The Orthodox monastic community of the Church of the Nativity in Bethlehem related this story to Mr. Lycourgos Markoudes who writes here as he heard it. The story begins on Holy Monday afternoon when the Church of the Nativity was practically empty of pilgrims. The monks were in the area of the church where they attend to the needs of the church. This is a short distance from the steps that lead to the Cave of the Birth of Christ. At one point, they saw a man approach them and he appeared to be very emotional. He took two candles and with great emotion he approached the icon of the Panagia of Bethlehem. He lit the candles before the icon and with tears flowing from his eyes he turned towards the monks who were looking at him with concern. He told them that he was a Muslim from the area around Bethlehem and that during the previous day he saw the Holy Mother in his sleep. She invited him to visit the place where she had given birth to her Son and he was to enter the area through a low doorway. He was told to proceed to the right and then go to the area where he would find her and then light two candles before her icon. This man had not visited this church since he was a very young child and he did not remember anything about it. When he arrived there on that afternoon, he left his car running with its emergency lights flashing in front of the main entrance of the church, in an area that has restricted parking. His wife had remained in the car. When he arrived, he proceeded to enter walking briskly toward the low doorway of the church. He realized as he was proceeding ahead that everything was exactly the way that our Holy Virgin had described it to him. He then went right and down some stairs of Justinian’s church and he entered the right area of it. This is the area that is under the jurisdiction of the Orthodox Church and it leads to the Cave where Jesus was born. 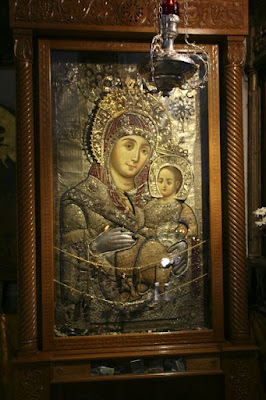 The icon of the Holy Mother was exactly in the place where she had indicated it would be. And the icon was exactly the same one he had seen in his dream. It was the icon of the Panagia of Bethlehem. This wonderworking icon is the resident icon of the Church of Bethlehem and it is located on a prominent icon stand on the right side of the steps that lead to the Cave of the Birth of Christ. The facial features of this icon overflow with an infinite expression of love and calmness while the faint smile on her face brings joy to the hearts of pilgrims. The icon is surrounded with precious fabrics and jewels. 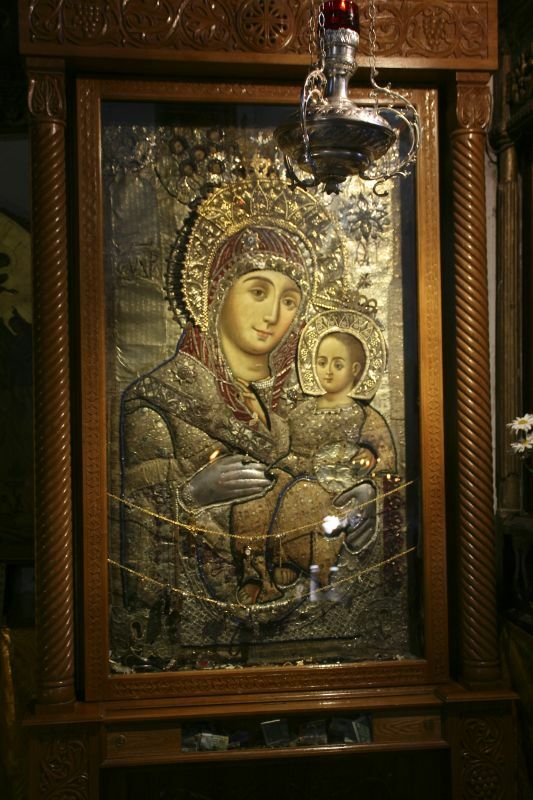 There are no solid details about the origin of the icon but tradition says that it comes from Russia and it is connected with the Russian Empress Catherine. This Empress visited the Holy Land after a miracle that was performed by the Mother of God. As a result of this, she gave her imperial clothing so that the Mistress of the World could be dressed in them. She also gave her jewelry so that they could be placed on the icon. She also directed that future empresses should not wear rubies so that henceforth this distinctive honor would only belong to the Queen of Heaven. This is the icon that this Muslim came to reverence when he arrived at the Church of the Birth of Christ late afternoon of Holy Monday. He naturally did not know how to speak Greek and the conversation with the monks was in Arabic. This was unbelievable news that this Muslim brought to the monks. The monks offered him a small icon of the Panagia which he accepted with thanksgiving. He left the church quickly, just the way he arrived, but he then returned again in a few moments. He had forgotten that the Virgin Mary had also told him that while entering the church, he should see her friends on the columns of the church. The monks then took him to see the columns of the church which have icons of saints painted on them; some of these icons today are just shadows, some are blackened and others are completely faded. These are life size figures of the Saints of our Church. These are the friends of our Panagia. After seeing the columns the Muslim again left quickly and has never again returned to the church. But the All-Holy One, the Mother of God and our Mother, through this miraculous occurrence came to show her support for us so that we will have patience, hope and consolation and also to assure us that: “Her Son will come again and He will gather up all those who are close to Him.” Let us, therefore, not dare to distance ourselves from Him, so that we can taste His salvation. Amen.